Over the past 17 years, APQC has studied every aspect of knowledge management (KM), from strategy design to the best ways to motivate employees to share knowledge. One enduring question that remained unanswered, however, was how best-practice organizations put knowledge in the flow of work. In other words, how do they integrate knowledge sharing and collaboration to the point where these activities are no longer viewed as separate, “KM” pursuits, but rather as integral parts of the work being done? measuring KM in the flow of work. 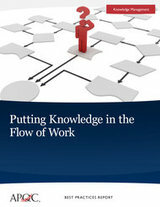 Download this report and find out how best-practice organizations Alcoa World Alumina, MWH Global, Nalco, NASA, and Tata Chemicals have integrated knowledge sharing and collaboration into every aspect of their operations, creating work forces that are hardwired to collaborate and share what they know. Click here to read an overview of the study findings.